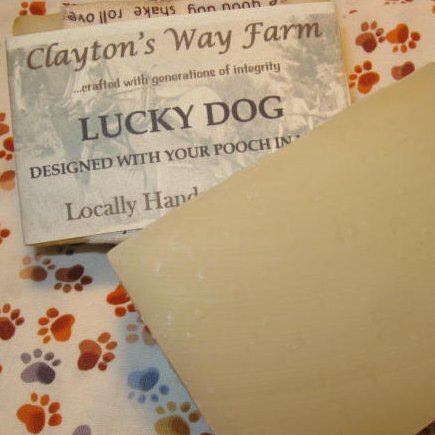 Our 'Lucky Dog' bar has made bath time with Fido a whole lot easier! Simply wet fur, rub, lather and rinse. Did we mention how easy rinsing is....? 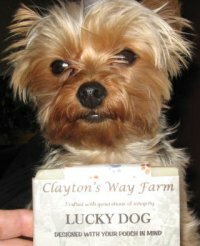 'Lucky Dog' has a higher percentage of grapeseed oil, an ultra light penetrating oil rich in vitamins, minerals, proteins, and linoleic acid. It imparts shine and does not cause allergic reactions (one of the reasons it is often used in creams, lotions, balms, and other hypo-allergenic moisturizers). Scented with essential oils reputed to discourage pests, Lucky Dog will leave your dogs skin and fur clean, moisturized and lightly scented with a natural, pleasing scent. Thanks to the powerful sales of this soap by our sister Cathy, and testimonials from customers, this is one of our BEST selling soaps! NOT RECOMMENDED ON CATS. Can be used on humans! Ingredients: Saponified coconut, palm, olive, soybean, grapeseed, and castor oils. Cedarwood, cajeput & peppermint essential oils.